The Mobile World Conference is typically used as the launch pad by many of the big manufacturers to reveal their latest phones and the MWC 2016 has delivered lots of great phones. Here in our MWC 2016 top smartphone round-up we check out the releases from the top manufacturers. Perhaps the most anticipated reveals of the MWC event this year were the flagship models from Samsung that will head up their Galaxy range. 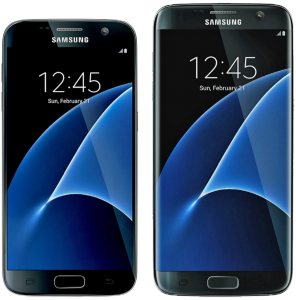 The Samsung Galaxy S7 and Galaxy S7 Edge received plenty of attention at the event and although the design elements may have not changed too much a couple of additions were welcomed to the new models. Samsung ditched the MicroSD card slot on the S6 opting for a fixed memory instead but they have now thankfully returned the MicroSD card option to the Samsung Galaxy S7 and S7 Edge. The latest additions are also now water resistant, something Sony has been doing with it’s Xperia range, which is always good for rainy days. The main improvements on the handsets comes in the form of a bigger capacity battery and 4GB RAM for impressive performance when running demanding apps. The camera comes in the form of a Dual Pixel lens meaning that dual photo diodes are on board,a smartphone first,to capture maximum light and focus quickly. Fingerprint security as well as KNOX encryption is included and processor includes a liquid cooling tube to reduce heat generation which in turn improves battery efficiency. A new addition sees an “Always ON” display configuration showing the time, calendar and notifications which has been shown to save battery life as it removes the need to keep waking the phone up to check on incoming notifications. The Samsung Galaxy S7 has a 5.1-inch display and the S7 Edge has a 5.5-inch curved display with additional customisation features for the edges of the display including adding up to 10 apps. Android Marshmallow is featured on both phones and they are both now available for pre-order so if you want to get your hands on one get your order in now. The LG G5 leaked info had been coming thick and fast before the launch event but all the information didn’t hint at the addition of the accessory slot. A panel can be disconnected from the base of the smartphone and replaced with different modules such as the Cam Plus module demonstrated during the event. The module offers physical buttons for power shutter and zoom along with exposure lock and autofocus usually only seen on digital cameras. This is the first replaceable module of its kind seen on a smartphone and opens up possibilities of all sorts of module options including a portable hi-fi DAC player also showcased during the launch. The camera setup on he LG G5 consists of two cameras on the back for a 135 degree wide angle shooting range and the G5 also has an “Always ON” display that can work with the Quick Case so you can clear notifications and other actions through the cover without opening it up. You can watch the official launch video here. The Lumia 650 has been hailed a great budget phone by many who got to have a go with it at the event and the precision engineered design have been described as more high-end than the more expensive phones in the range. Windows 10 with Office 365 set up makes this a good phone for work as it will work with existing company Microsoft IT platforms and there are built-in security features to keep information safe. The 5-inch HD display is super bright and designed to work well in sunlight and it sits within the diamond cut metal frame giving the phone a premium look and feel. The main camera is an 8-megapixel sensor and the front facing 5-megapixel camera on the front is a wide angle lens for getting more more into the shot. There is 16GB of on board memory and the phone is powered along by a quad-core processor and 4G is included too. These are just some of the biggest announcements to come out of the MWC 2016 with lots more to come so we can all enjoy a snapshot of the top phones heading our way this year. What do you think of the latest phone announcements? Do you like the idea of an “Always ON” display? Do you think it will be useful? Share your thoughts below or join in the conversation on Google+.